Project Integration Management includes the processes and activities needed to identify, define, combine, unify, and coordinate the various processes and project management activities within the Project Management Process Groups. Develop Project Charter — The process of developing a document that formally authorizes the existence of a project and provides the project manager with the authority to apply organizational resources to project activities. Develop Project Management Plan — The process of defining, preparing, and coordinating all subsidiary plans and integrating them into a comprehensive project management plan. 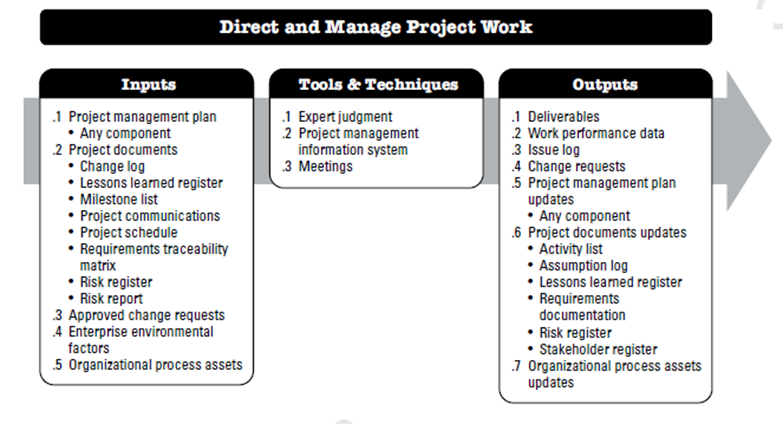 Direct and Manage Project Work — The process of performing the work defined in the project management plan and implementing approved changes to achieve the project’s objectives. Manage Project Knowledge – The process of using existing knowledge and creating new knowledge to achieve the project’s objectives and contribute to organizational learning. 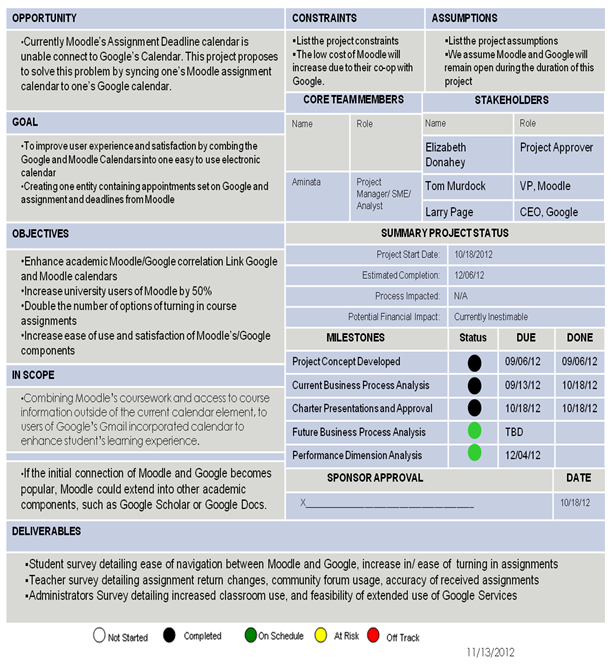 Monitor and Control Project Work — The process of tracking, reviewing, and reporting project progress against the performance objectives defined in the project management plan. Perform Integrated Change Control — The process of reviewing all change requests; approving changes and managing changes to deliverables, organizational process assets, project documents, and the project management plan; and communicating their disposition. Close Project or Phase — The process of finalizing all activities across all of Project Management Process Groups to formally complete the phase or project. Project Integration Management is specific to Project Managers and cannot be delegated or transferred. Makes integrated decisions regarding key changes impacting the project. Iterative and Agile approaches promote the engagement of team members as local domain experts in integration management. The control of the detailed product planning and delivery is delegated to the team in case of agile environment. The process of developing a document that formally authorizes the existence of a project and provides the project manager with the authority to apply organizational resources to project activities. The key benefit of this process is a well-defined project start and project boundaries, creation of a formal record of the project, and a direct way for senior management to formally accept and commit to the project. Expert Judgment - To assess the inputs used to develop the project charter. The Project Charter should be issued by the project initiator or sponsor. A project manager is assigned as early in the project as feasible, preferably while the project charter is being developed and always prior to the start of the planning. Develop Project Management Plan is the process of defining, preparing, and coordinating all subsidiary plans and integrating them into a comprehensive project management plan. The key benefit of this process is a central document that defines the basis of all project work. 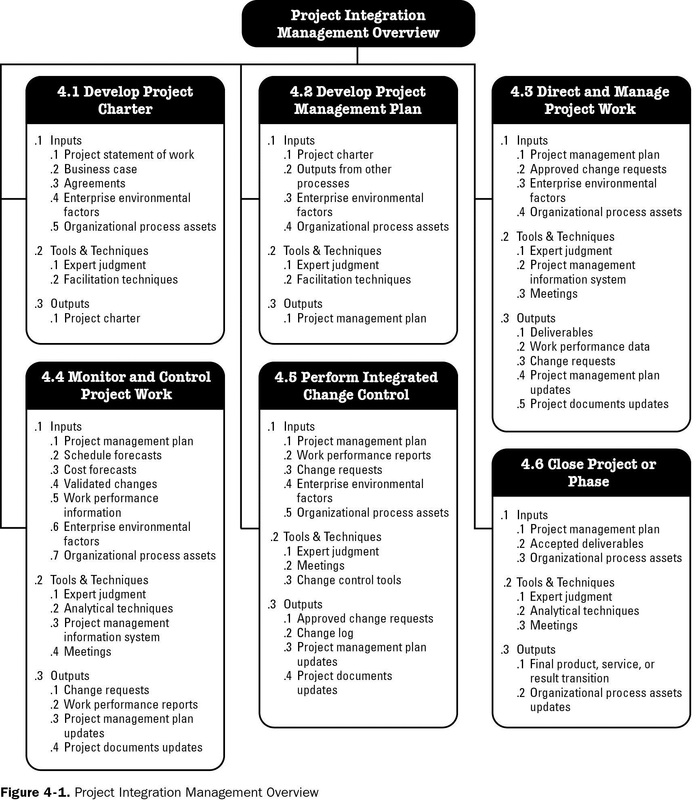 The project management plan defines how the project is executed, monitored and controlled, and closed. The Project Management Plan integrates and consolidates all of the subsidiary plans and baselines from the planning processes. Along with the Project Management Plan, Project Documents are used to manage the project. Once the Project Management Plan is base lined, it may only be changed through the Perform Integrated Change Control process. 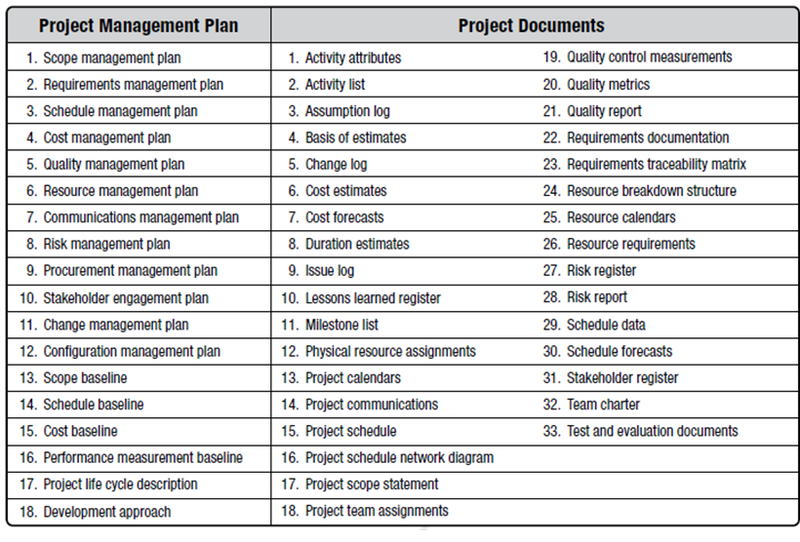 However, the Project Management Plan is often updated with Outputs from other processes. To ensure stakeholders' buy-in, the Project Management Plan should be prepared with input from the project team, and then approved by relevant stakeholders. The Project Management Plan integrates and consolidates all of the subsidiary plans and baselines from the planning processes. Direct and Manage Project Work is the process of leading and performing the work defined in the project management plan and implementing approved changes to achieve the project’s objectives. The key benefit of this process is that it provides overall management of the project work. Collect and document lessons learned and implement approved process improvement activities. Approved change requests are an output of the Perform Integrated Change Control process, and include those requests reviewed and approved for implementation by the change control board (CCB). The approved change request may be a corrective action, a preventative action, or a defect repair. The approved change requests can also modify the policies, project management plan, procedures, costs, or budgets or revise the schedules. Defect repair—An intentional activity to modify a nonconforming product or product component. Any unique and verifiable product, result, or capability to perform a service that is required to be produced to complete a process, phase or project. Detailed data collected about deliverables during project execution are valuable for monitoring and controlling the project. Change Requests - There are different types of changes that may be considered throughout the project. In addition to updates to the Project Management Plan and project documents, changes may also include corrective action, preventive action, and defect repair. Manage Project Knowledge is the process of using existing knowledge and creating new knowledge to achieve the project’s objectives and contribute to organization’s learning. The key benefits of this process are that prior organizational knowledge is leveraged to produce or improve the project’s outcolms and knowledge created by the project is available to support organizational operations and future projects or phases. Follow the link to know more about Monitor and Control Project Work of Project Integration Management.